Cherrapeno: Chocolate Fruit Cake - for Christmas! Chocolate Fruit Cake - for Christmas! As we head into October, it's time to start thinking about.... I can't bear to say the word.... yep, Christmas! I'm one of those who truly does leave everything to the last minute, shopping, baking and menus. But this year, I was contacted by Morrisons - the large supermarket chain - asking if I would like to join other bloggers and make a Christmas cake. The idea is to encourage their customers to bake their own cake, whether it be a traditional fruit and nut one, or something a bit different like my own chocolate fruit cake. Making your own Christmas cake is easy if you get all your measured ingredients together first, the nuts roasted and the fruit chopped - remembering to marinate the fruit overnight. A little bit of mixing and your cake will be ready to pop into the oven. Your house will smell heavenly and if you feed the cake every week with some alcohol to stop it drying out, you will be rewarded with a moist, rich cake. My husband adores traditional fruit cakes, but I am less tempted with all the mixed peel and glace fruits, which is why I came up with this chocolate version. The beauty of this cake is that you can play around with the fruit, substituting the cherries with cranberries for example. 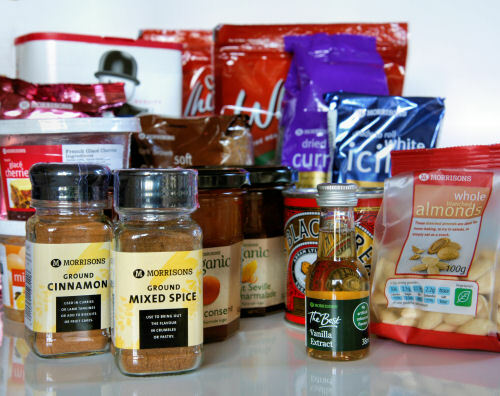 You can swap the nuts for your favourite kind and even change the brandy to rum if you want. For those who prefer not to use alcohol, you can substitute apple juice when preparing the mixture. If using apple juice, the cake can then be well wrapped and frozen for up to three months, defrosting the day before you want to decorate and serve it. The nuts can be roasted and chopped the day before - make sure you keep an eye on them while they are roasting in the oven, they can easily burn. Another great thing about this cake is that you don't need to make it this far in advance, a month or even a week before will still be adequate. If you want to make the traditional Christmas fruit cake, head over to the Morrisons website for their recipe, which is just as easy to make and looks quite delicious! There's also a large database of recipes to browse, including seasonal recipes and healthy eating tips. A different kind of fruit cake, studded with nuts, dried fruit and chocolate. 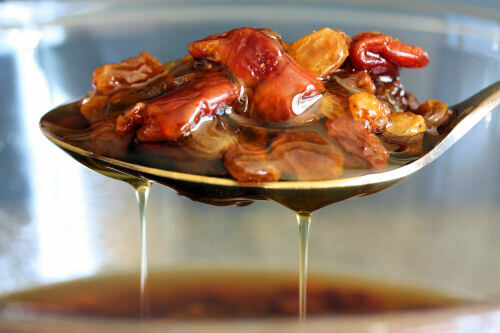 One of the nice things about this recipe is that you can make substitutions to your liking - for example, swap the dried cherries for dried cranberries or apricots, sultanas for raisins, almonds for pecans and brandy for rum. Instead of the traditional marzipan and thick fondant icing, I used white chocolate to cover the top of the cake, made some fondant snowflakes and sprinkled with edible glitter. 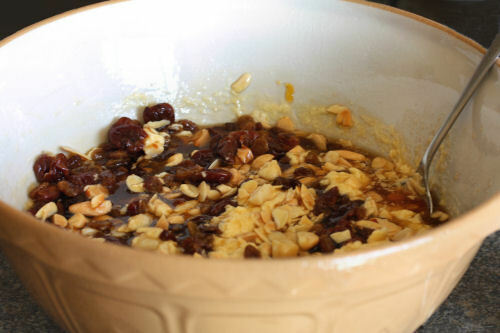 Soak the dried cherries and the sultanas in a bowl along with the brandy for at least one hour or preferably overnight. Set the oven to 14oºC and line a 23cm (9") deep cake tin with baking parchment. A spring form tin or one with a removable bottom is ideal. Spread the flaked almonds, macadamia nuts and blanched almonds onto baking trays and roast in the oven until brown, about 5-8 minutes - keep an eye on them, they can easily burn. Let the nuts cool before chopping. 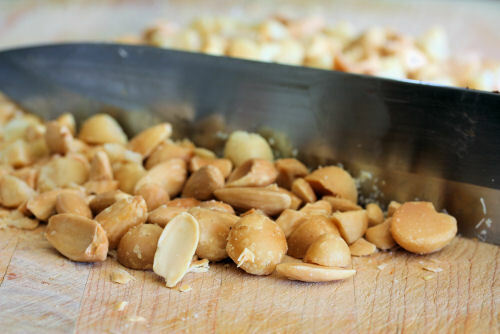 When the whole nuts are cool, chop them finely with a large knife on a chopping board. Don't chop the sliced almonds, they go in as they are. In a large bowl, cream the butter and sugar together. Add the eggs one at a time, followed by the flour and half of the ground almonds. Add the honey to the marinating fruit, along with the apricot conserve. Stir well. 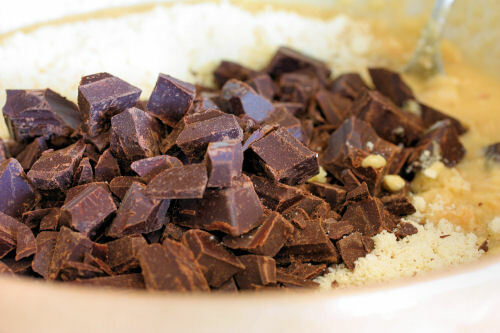 Pour this mixture into the large bowl, along with all of the nuts (including the remaining ground almonds) and the chopped chocolate. Stir well until everything is incorporated. Pour the cake mixture into the deep cake tin and bake for between 2 - 2½ hours. Keep an eye on the cake and test with a cake tester or a skewer until it comes out clean. You may need to cover the cake with some foil to stop it getting too brown. Leave the cake in the tin to cool. Once cool, make a few holes in the top of the cake and pour over 3-4 tablespoons of brandy. You can do this a few more times to make the cake moist and rich before decorating. The cake can be kept well wrapped for a few weeks in a cool dark place, feeding with the alcohol every so often, or it can be frozen for a couple of months. Serve really thin slices as the cake is VERY rich! Use a cutter to punch out perfect snowflakes - decorating made easy! This is now the third Xmas cake I see written about this week. Scary. I can't believe it is that time of year already. It looks wonderful though and perfect for me, because like you I'm not that much into the more traditional fruit cakes. I adore people who can make their own Christmas cakes!!! Do you ship? Hahahahahaha. And the snowflakes are absolutely stunning!!! Oh my! 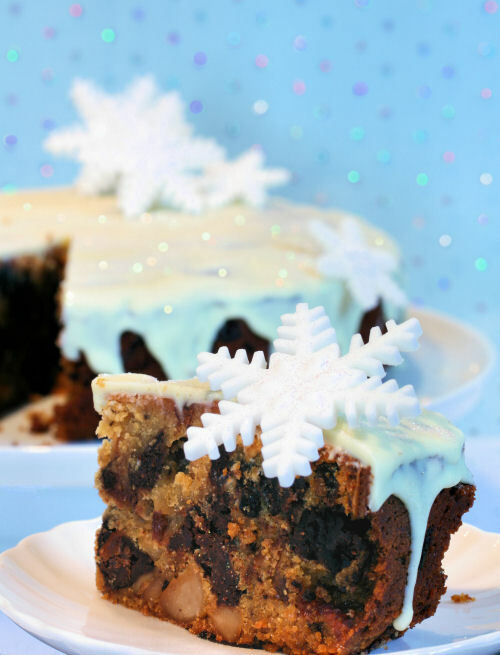 I think you have just solved all my Christmas cake issues forever and ever amen! Ah I was wondering who the other bloggers Morrisons had contacted here. Fantastic looking and sounding cake. Interesting to see we have both done very different twists on the traditional cake. Wow! How cool that you are getting an early start on your baking. I haven't made a fruit cake in years but I love your version - fantastic idea. No...do I have to wear garlic around my neck to ward off Christmas. Only kidding, since it is my favourite time of the year. 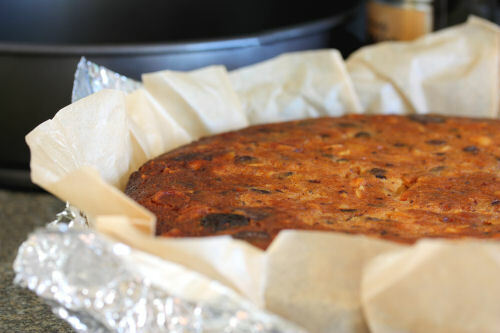 For years I made my own fruitcake and this looks like a very tasty version. Wow!! You have done an excellent job!! Being Belgian, I also don't like the candied fruits etc. I think you have made the best christmas cake ever!! LOL...thanks to Morrisons & we have an early cake. How delish Nic! Am glad you like chcolate coz I rarely see a chcolate Christmas cake. You got me all thinking now. maybe it's a good time to work on soaking fruit now...hmmmmmm!! Well done! Fantastic pictures Nic - you are just so tricky being able to make all these nice things and take excellent photos too. 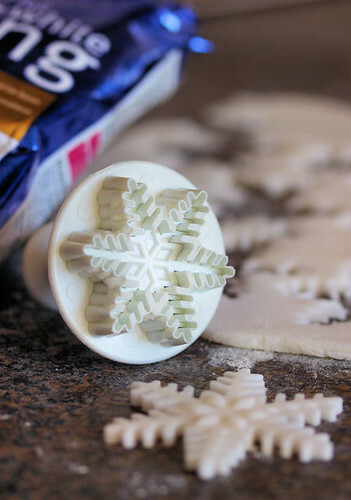 I LOVE that snowflake cutter thing - I need one! Beautiful cake - this cake will be great for chocoholics! Yikes I can't believe that the season is nearly upon us! Great looking cake!!! Can it be Christmas already?! Sylvie - bet there will be a few more before the week is out! KennyT - aw thank you, but this cake is really easy to make - even you can do it!! Grace - I know it's too soon, but don't you find the weeks leading up to it are the fastest in the year???!! Chele - I hope so, lol! Snooky doodle - You don't need a cutter like that, you are the queen of decorated cakes, they are all so beautiful! Jules - thank you! It's very interesting to see what the others have done, yours was fabulous! WizzyTheStick - thanks! I usually make this one and my mum makes the 'proper' one. Valli - keep the garlic on for another month or so, can I borrow it? Sophie - I didn't know that Belgians were not so keen on the candied fruits, I might have to move there! Deeba - I know, weren't Morrisons nice! I often need a little kick to get started, now you go and soak that fruit!! Jan - thank you so much! I think they might sell those cutters in Lakeland in the run up to Xmas. Half Baked - it's sneaking up upon us slowly, I wish we coulc keep it in December though! Chocolate Shavings - ha ha, did you forget to put your stocking up last night???? Oh I love the feeling & excitement of Christmas. This fruit cake looks wonderfully rich! I once read about the history of fruit cakes and it said that those made with lots of brandy or whisky can be kept for up to 100 yrs! Even if it can, don't think it actually happened. But nevertheless, interesting to know. It's beginning to look a lot like Christmas! I Love it! If you need taste testers, or to see how they ship, I'm willing to help you out! ;) Love love love the snowflakes! I think now is the time to start making your Christmas Cakes, so you can lace them each week with brandy!! Nic, your cake looks beautiful, I adore the snowflakes and glitter. 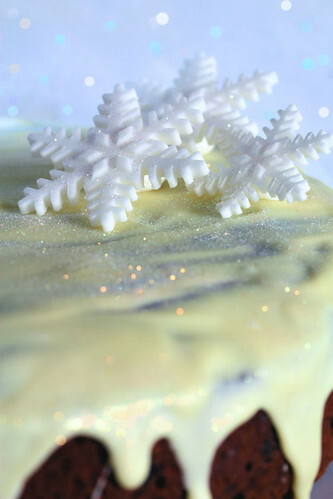 I'll be making my xmas cake this month, can't wait!! I would definitely love this, it looks fantastic! Wow, that's beautiful! I've only started thinking about Thanksgiving last week, I'm not ready for Xmas yet! :O You've just reminded me that if I want to bake fruitcakes, I'd better start soon! Love the idea of chocolate in it! OK, I know I've left it late, but I'm currently cooking this cake (literally, it's in the oven with 1.5hrs to go). It looks delicious, but I've never cooked a fruit cake before, so fingers crossed. I never follow a recipe exactly (drives my Nanna insane) and I've added more fruit then it says - I wanted prunes too... and I didn't have scales when I did the fruit soaking part. Oh - and I'm using port - it's all I had :). I'm not sure how to decorate it as I live in the sticks and I can't even find gingerbread cutouts lol. Is it ok if I copy this into my blog (references you and your blog of course) or paste a link? Hope it goes well - fingers crossed. Jessica - I'm really bad at following recipe too, but that's how new ones come about right?! Hope you like the cake - prunes and port sounds good, and you could always just dust with icing sugar. PS. It's fine to paste a link.